At Age Well Senior Services, we’re doing our best to make sure no senior in need goes hungry by providing our vital nutrition programs – Meals on Wheels and Senior Center Lunch. 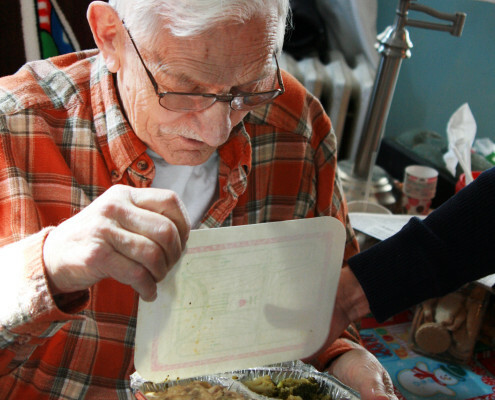 Annually, we deliver over 300,000 nutritious meals through Meals on Wheels to seniors who are living at home with little or no assistance to obtain adequate meals. Specifically created by our registered dietitian to meet the nutritional needs of older adults, each delivery consists of THREE meals: (1) a hot, ready-to-eat meal, (2) a cold meal to eat later in the day, and (3) a breakfast meal for the following morning. Volunteers deliver meals Monday through Friday between the hours of 10:30 AM and 1:00 PM (excluding observed holidays). Please select the location nearest to the recipient’s home from our senior centers listed HERE. Seniors (60+) living in South Orange County, which includes the cities listed below. Age Well Senior Services has a suggested donation of $7.50 per day, though no one who is eligible is turned away for inability to pay. For more information, please contact the senior center nearest you. We are your Meals on Wheels provider for South Orange County, California. If you are in need of Meals on Wheels and are not in our service area, please contact National Meals on Wheels at (800) 677-1116.